Looking at life and the outdoors from the back of the pack. Now entering the SECOND Generation of testing with Beau. I plunked down the cash for this one after researching it and actually have nothing to say in way of critique. 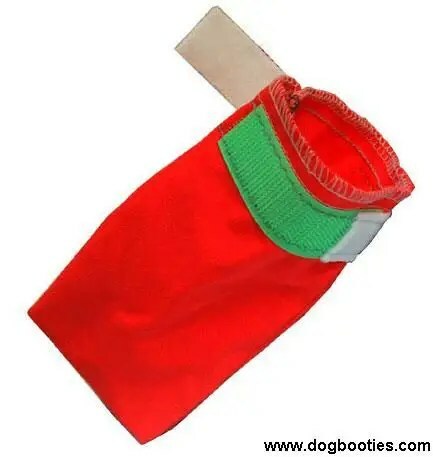 Superior pack, rides well, comfy on the pup, great visibility day or night (provided you get blaze orange or red) as it has a strip of 3M reflective tape down each side. Padded slide release buckles. Holds lots of gear with 1150 cu in. Plenty for up to a week, possibly more. Can strap gear to the outside as well. 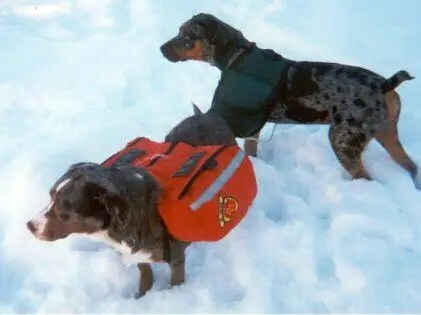 (Shown with Traildog patches). $59 from Wolfpacks. Patches are also sold by Wolfpacks and the prices vary. I have both the Approach II dog pack and the Palisades II dog pack. They are similar in fit and style, though the Palisades pack is more expensive. The higher price gains a harness which separates from the saddlebags, an integrated hydration system (water bladders in their own pockets), padded paniers, and expanded volume. The Ruff Wear customer service is also the best I’ve yet to encounter for any manufacturer, not just in the backpacking or pet industry. Prices vary by size. Approack II dog pack $50-$60 Palisades II dog pack $80-95 from Ruff Wear. This one I converted from a (horse) saddlehorn bag to a dog pack this one is hunter green. I also have a cranberry red pack and a navy blue pack. I had to buy some strapping for them. Pattern on the . Good only for a day pack or an overnight with very little gear. Velcro fasteners on flaps. $20 hand made (Pack from Tractor Supply Company). You should be able to get buckles and webbing at any hardware store, fabric store or outdoor outfitter. 330 Denier. Used also during the John Beargrease Marathon. Light, durable and come in designer colors (black, tan, blaze). Cheaper if you buy pre-cut. Cheaper still if you make your own from the pattern on the hand made gear page. 80¢ each if you buy them pre-made, 60¢ pre-cut at dogbooties.com; hand made= unknown price. Tag– this is my non-trail tag collar. Leather with brass harware. Matches the leather leash below. Looks good and can be removed quickly for the ring. $6 at TSC. LEASHES- Trail and obedience On the trail I use a 10′ nylon sport dog check cord for Lucy. Neon orange. soft, 3/4″ wide, visible and long enough to tie her up with or use as a hands free leash. Stainless bolt snap. $6 at TSC. Make your own leashes on the make your own gear page. Sledding- X back racing harness. Fully padded with polar fleece, black heavy nylon web. Leather at the cut end points. Looks good while doing the job. $13 at Adanac Sleds and Equipment. Carting– Navy blue. Hand made, fully padded, steel hard ware. $9. Make your own harnesses on the make your own gear page. SNACKS Zukes Power Bones. Good eaten! I hate the smell but Lucy ADORES these things. Great pick-me-up on a long hike or when at a trial. Peanut Butter, Beef or Chicken, though PB is her favorite. $1.79 at any pet or outdoor store, at least those online. The bars are harder to find, but you can get them in large bags at most pet/outdoor stores. There are new formulas out for joint health, no fillers and so forth. I’m often asked what I feed the dogs. That’s hard to answer. It always depends on what the dog needs. I used to feed Purina (and the Wal-Mart knock-off Maxximum Nutrition) before I found Nutro and Diamond. Nutro Max and Nutro Natural Choice are good, as is the new line of food from Diamond- “Diamond Naturals”. None of these have by-products and very little, if any, fillers. Diamond Naturals contains no corn. When the dogs are having “fat days” such as when they’re less active in the winter, I feed Nutro Natural Choice Senior as it has reduced fat and protein levels as well as glucosamine and chondroitin for their joints. When they are working hard, such as a very long trip, I feed a formula with a higher fat/protein level. Stool volumes are very low, their teeth are clean, the dogs are healthy and perform well. I do suppliment Fish Oil for their skin, coat, and joints. I have had good results with an additional suppliment of psyllium fiber (a fermentable fiber) to help prevent stress diarrhea as per recent studies in sled dogs. The price for all of the above is also very reasonable, around $20 for 40 lbs. The ads and stores below support this site via sponsored links. Based on a work at www.uberpest.com. Copyright © 2019 UberPest's Journal. All Rights Reserved.